Nigerians have taken to social media to react to the alleged wedding photos of two 19-year-old students in Ondo state. 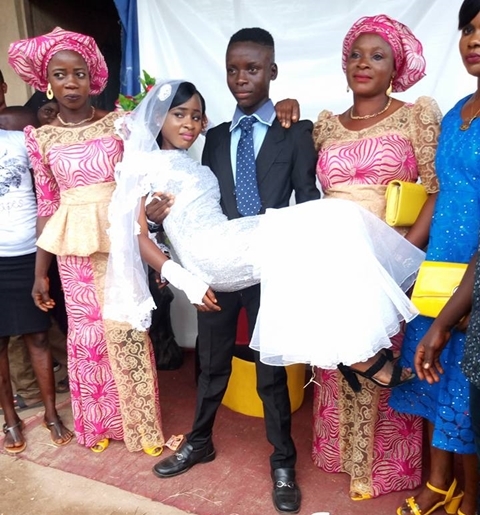 A Facebook user identified as Olajumoke Oluwadamilola, has taken to the social networking platform to shared some photos of a teenage couple who were recently pictured getting married on their wedding day. She captioned the photos: "Wishing you all the love and happiness in the world and congratulations on your marriage. Imagine 19 years student get married to eachother." Meanwhile, the photos have been trailed with mixed reactions and criticisms as Nigerians have reacted to the alleged wedding of the two 19-year-old students in Ondo state. Many have also condemned the act because the couple were just teenagers, while some added that their parents should not have allowed such a union to take place. Some online users are of the opinion that the teenagers dressed up as a wedding couple for their school’s drama program. A commenter, Chrysolite Seyanu Olukemi wrote: "Are you sure is not end of the year party playlet? You people come out to defend yasef before your name spoil finish.... Anyways you can make it real later in future." One Dyoni Chux said: “My dear, whether school drama or not, I've seen this type of marriage happening several times. I could be that he's an only son to his father who's also an only son. And if he's been trained to be mature in spirit and mentality nko? See forget all these new set standards that are ruining Africans. "Back in the days our great grandfathers married at age 17-21 to wives from 12–17. That's why they give birth at early stage, concentrate and raise their children early, and retire at the age of 40-55 years as elders and grandparents with large households. That is why the live up to 120years. But because of western education everybody wants to acquire certificate and end up as okokporo. While another commenter wrote: "Tijesunimi Adeyemo It's Either a school drama. Or the girl is already pregnant for the guy. Just thinking tho."